Guitar synthesizers have been available in one form or another for the best part of ten years. Unlike keyboard players however, guitarists have been relatively slow to embrace the technology. There are many reasons for this. Firstly, the guitar is a difficult medium for synthesis and this has created problems for both musician and manufacturer. 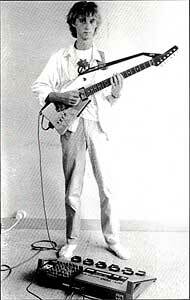 Secondly, the guitarist has been understandably reluctant to adapt his/her playing style to an imperfect instrument. Thirdly, despite the decreasing cost of technology, the guitar synthesizer has always represented, at least in guitarist's terms, a daunting investment. Despite these reservations, a growing number of guitarists are now looking to the synthesizer for ways to expand their musical vocabulary and only the most deeply entrenched traditionalists could have failed to notice the huge technological advances that have been made over the last eighteen months. Although the Synthaxe and the Synclavier have become increasingly newsworthy, it is perhaps Roland who are most closely identified with the long-term development of the guitar synthesizer. Over the next six months, using the Roland GR-700 system as our point of reference, I'll be examining many different aspects of guitar synthesis - ranging from MIDI and its implications for the guitarist, to adapting your playing style, programming, recording and amplifying synthesizers, as well as passing on some tricks of the trade and answering any questions that may arise from the series. 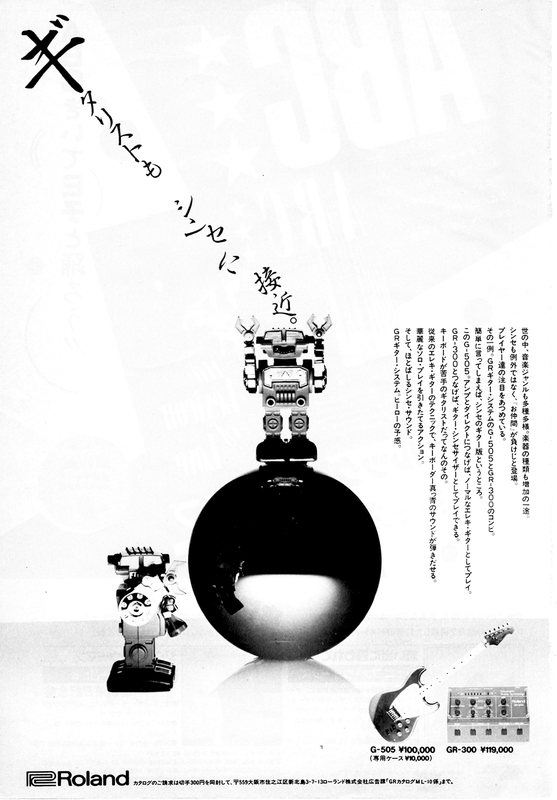 Also, each month, I'll be explaining the various functions and parameters of the GR-700. I should point out that many of the topics covered in this column don't apply exclusively to the GR-700. 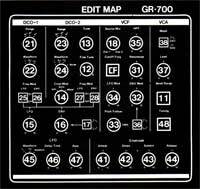 Synthesis is, in many ways, about common sense and logic, so much of the information will be of use to Roland GR-500 and GR-300 owners. Even regular electric guitarists could benefit from applying some Synth-Ethnics to their playing. Now (and this hurts me more than it will hurt you) I'm forced to administer a does of the fundamentals. Of the many guitar synthesists I've met both in the UK and abroad, only a very few seem to have even a passing knowledge of how a synthesizer actually works. This situation has, unfortunately, only been exacerbated by the introduction of the GR-700. Here for the first time, the guitarist is confronted with a truly programmable polyphonic synthesizer and whilst it is possible to make perfectly good music using only the preset patches, it would show a serious lack of enterprise editing facilities available on the GR-700. It's try that one can chance upon some spectacular sounds by random noodling, but an empirical knowledge of a synthesizer is not enough when it comes to editing for specific passages of music. 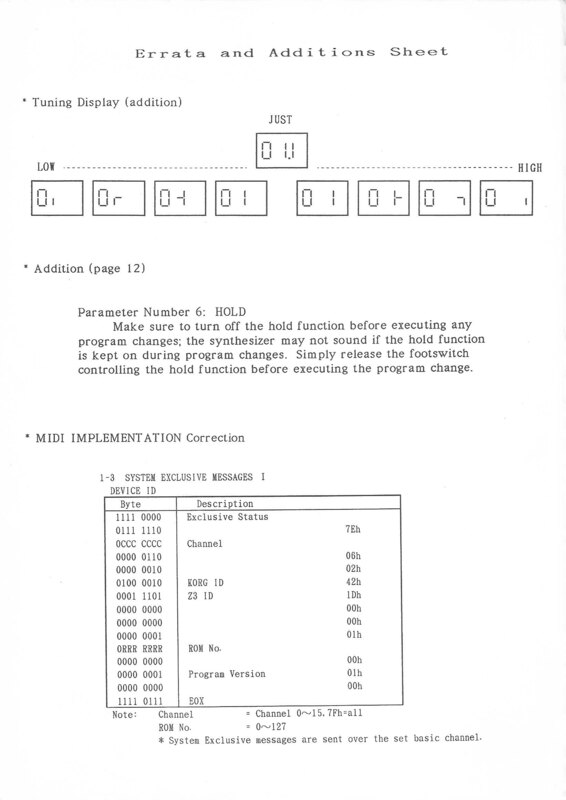 When editing on the GR-700 you can access the parameters two ways - either internally through the edit function or externally, via the PG-200 programmers. If you don't own a PG-200 I'm afraid to say you're at a disadvantage, simply because it is much more difficult to visualize the patch you are trying to create. 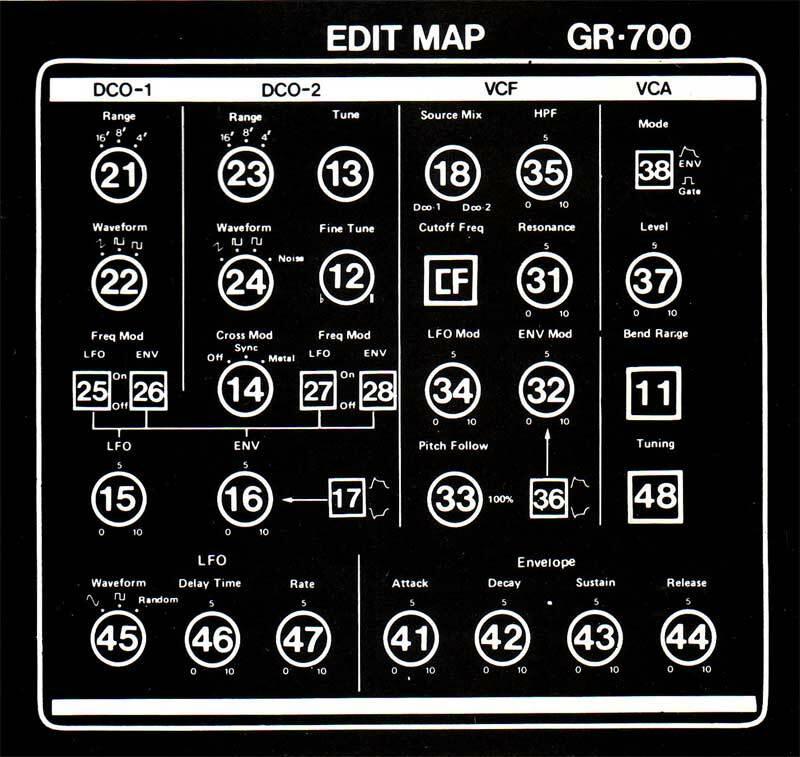 But for the moment, I'd like to refer you to the GR-700 Edit Map, which is basically a map of the PG-200 programmer. Starting from the top left of the map we have DCO-1 (Digitally Controlled Oscillator). Now the oscillator is the sound source of any analog synthesizer . On many synthesizers the oscillator will be called a VCO (Voltage Controlled Oscillator) but still serves essentially the same purpose as a DCO. Here's how it works: the oscillator receives its information via the keyboard, or in our case from the guitar via the GR-700 flow modules. For a VCO this information is in the form of a voltage (usually 1 volt per octave, subdivided into twelfths of a volt to correspond to the twelve notes of the chromatic scale), hence the term 'Pitch to Voltage'. However, a computer inside the GR-700 converts the pitch information to a digital Binary code - hence it is called a DCO. On receiving this information the oscillator will literally oscillate at a rate corresponding to the pitch first transmitted, is 440 Hz or vibrations per second, would equally concert A above middle C, just like a tuning fork. Both DCO-1 and DCO-2 are therefore the sound and pitch source of the synthesizer. Two other parameters are immediately apparent within DCO-1 and DCO-2 and they are Range and Waveform - both of which I will discuss in a future column. Moving along to the right of the edit map we come to the VCF (Voltage Controlled Filter). The two primary functions within the VCF and the Cutoff Frequency of the filter and Resonance control. At the risk of over-simplification these can be seen for the moment, as tone controls. On the far right of the map we have the VCA (Voltage Controlled Amplifier). The main function here is the level control which effectively controls the volume. To sum up we can make a diagram of the points covered so far. So in the above diagram we have the three most essential components of a recognizable musical sound. Before I finish this first column of the series I'd like to make it clear that these articles are written for the sole purpose of demystifying guitar synthesis. So if you have any questions please write to me c/o Guitarist Magazine. Next month I'll be talking about envelope generators and how to adapt your playing style to the guitar Synthesizer.